Euro Youth Hostel is located next to the Hauptbahnhof and features comfy rooms, large, clean bathrooms and modern security. Hostelworld guests say it 'has quite a homely feel despite being a large hostel' and plenty of character and that they'd stay here again. The bar is 'a great place to meet people and have some good conversations, which is appreciated since I was travelling alone', said one visitor. We like the privacy curtains on the bunk beds. Lonely Planet wrote : ‘Housed in one of the few buildings around the Hauptbahnhof to survive WWII, this atmospheric hostel-hotel oozes history with every dangling chandelier and creaky staircase. The bar is a delightful haunt, and the €2,50-a-drink happy hour (4:30pm to 8:30pm) is understandably popular. Despite having 200 beds spread over 58 well-kept rooms, this place is often full, so book ahead’. We’re located just 100m from the main train station and within easy walking distance of most of Munich's most central sights (Marienplatz, Residenz and co). The main station is also the local transport hub and therefore provides excellent access to suburban sights (BMW, Allianz arena, Nymphenburg) as well as regional sights (Neuschwanstein castle, Alps, Salzburg etc). The hostel is housed in an historic building, one of only very few buildings in the vicinity of the main train station to have survived WWII fully intact. 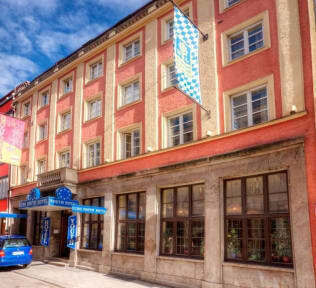 Built in the late 19th century, it was originally one of Munich’s very first luxury hotels (the Astoria). We have FREE high-speed Wi-Fi in all rooms (up to 400Mb/s), FREE internet terminals, FREE walking tours, FREE city maps, FREE lockers and FREE luggage storage. Our staff will be delighted to answer any questions you have about Munich and give advice on restaurants, nightlife etc. You can enjoy the privacy of a single or double room, or make friends in one of the small or large dorms. Bed linen is included and the beds are made for you. Please note that we only accept guests between the ages of 18 and 35 in the 12-bed dorm. Every room (other than the 10/12 bed dorms) is equipped with its own wash-basin. The recently renovated showers and toilets are either to be found inside the rooms or close-by in the corridor. (The bathroom for the 12 bed rooms is down one flight of stairs .. ca 20 secs walk). Please note that the breakfast is not included in the price of your booking. The fill-your-boots all-you-can-eat continental breakfast buffet (now including scrambled eggs !) is available from 7am to 11am for a bargain €4.90. Please also note: we do not have a guest kitchen. We’d like to but local Health and Safety laws make it impossible. We do, however, have supermarkets and cheap restaurants all around us which we'll be happy to point you in the direction of. We do offer free tea and a microwave. We’re one of Europe's Famous Hostels, with a bar selling Munich's best beer (and that's saying something) from only €2,70 during our Happy Hours, which run from 4:30pm to 8:30pm. We also serve dangerously cheap cocktails and Jaegerbombs. Our large-screen TV shows all major sporting events, including US sports, Champions League, EPL and all games of Bayern Munich. There are also discounts on pub crawls and bike tours. We have cheap laundry facilities plus board games and a book exchange. Please read our ‘Things to Note’ below before booking… especially the info about when we charge your card and making sure that it is valid on the day arrival. Great hostel with accessible location near the Hauptbahnhof and close to the centre of town. The lounge had great atmosphere and buffet breakfast was delicious- a good start to the day. Beds were comfortable and clean. A terrific budget stay! Staying at Euro Youth Hostel was a great choice. I’ve never stayed at a hostel prior to this trip but I would fully recommend staying here now. 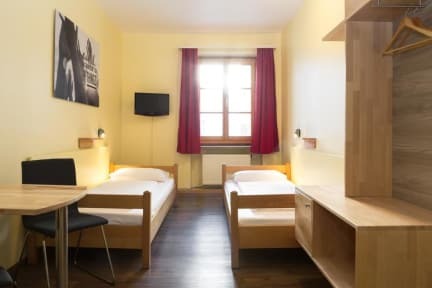 Location is ideal, less than a 5 minute walk from Munich HBF station and on a well lit road with many other hostels that are centrally located. The bar was a huge plus for grabbing a beer or meeting someone but did tend to get a bit loud on the weekend nights but that may only be an issue if staying in the first floor. The breakfast was delicious! We had a great stay at the Euro Youth Hostel in Munich. Breakfast is fantastic, rooms are clean, bathrooms were clean, beds were comfortable. My daughter and I spent three nights and would definitely stay at this location again. WiFi was a little slow but everything else was excellent. Clean, comfortable, and close to the city and main train station! Buffet breakfast for a great price, and staff is friendly and helpful. It was a good experience for me, right from check in process to check out to bar and atmosphere and crowd and location. Staff were extremely friendly, helpful, and seem to be enjoying their jobs. The room could get very loud at night, as the dorm I was in was quite close to the bar, though this was not as bad on weekdays. The breakfast was slightly overpriced for what you get, the budget option is pay them just a euro for a coffee in the morning, and get your breakfast food from the Lidl 1 minute walk down the road. Very cool hostel! Close to the main train station and a five minute walk from the city center. It is a big hostel but you still get the home feeling as the bar area is just for residents which is perfect for solo travellers!! Good happy hour and the events nights at the bar is really nice! Would recommend this hostel to anybody travelling to Munich. Overall very good. A little expensive. No kitchen nor game room. great location next to the main train station, nice lobby to drink and eat at, friendly and helpful staff, more suitable for older travelers (26+) it felt more like a hotel than hostel, not a young atmosphere. I personally found the common area too loud after 6pm...it has a very fun atmosphere if you are looking for the bar/pub atmosphere but if you want to have some quieter time there is nowhere else to enjoy a little downtime. I was very happy to have the train station so close, but the area was a bit dodgy at night. Happy with the staff, but when I checked in the bed was still unmade. Please know I enjoyed my stay but it doesn't rate as highly on my list as I was initially expecting is all. Aside from our perfect location (right next to the station and the old town), I think the best things about the hostel are the staff who are bursting to help you and the historic building which drips character from its chandeliers and yet has all the modern comforts (e.g. free fast Wi-Fi in all areas). The busy bar (probably the cheapest in Munich) is also a great place to meet like-minded people from all over the world. Munich is a fantastic place in all seasons and, aside from obvious attractions such as the beer gardens, parks, football, galleries and museums, I'd recommend to everyone to stay at least one day more and go out to the nearby lakes and mountains only 40 minutes away.